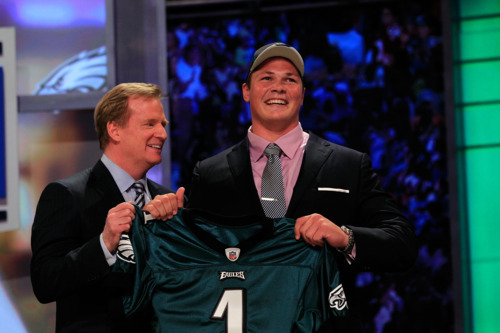 Danny Watkins, Eagles number one pick. Savior to the woeful right guard spot. But at 26 years old (27 in November), Watkins is one of the oldest players to be selected in the first round ever. Outside of his age, this looks like a solid pick by the Eagles. As I’ve written on multiple occasions, they needed help along the offensive line more than anywhere outside of perhaps cornerback. And after only four years of playing football, Watkins already has shown the talent to be a first round selection. Certainly there is a lot of potential for offensive line gurus Andy Reid and Howard Mudd to tap into. Plus, everyone praises the former fireman’s work ethic and maturity. But of course, there is the small matter of age. Even if Watkins becomes a Pro Bowler, his upside is limited. His second contract wouldn’t come until he was over the age of 30. That’s not a deal-breaker — 44 offensive linemen over the age of 30 started at least 10 games in 2010. But it is by far the biggest downside of the selection. Below are the scouting reports on Watkins from various draft experts and the selection they projected him to be picked in their most recent mock drafts. Probably the most interesting prospect in the whole draft… Spent both years [at Baylor] as the starting LT. Did a solid job there, but projects inside in the NFL. Doesn’t have the athletic ability or footwork for playing OT. Looks like a natural fit at G. Watkins is a tenacious blocker. He goes to the whistle. Or the echo of the whistle. Anchors well. Able to re-set when he is initially driven back. Sinks his hips and plays with good leverage. Feet are fine for playing in a tight space (like G or C). Also has a mentality that fits well at G. Sort of a bully. Likes to find a defender and really mash on him. Uses his hands pretty well. Still raw, but seems very coachable. Tagged with Philadelphia Eagles, NFL Draft, 1st Round, Offensive Line, Danny Watkins, Guard, Scouting Report, Age, Andy Reid, Howard Mudd, NFL, Rick Gosselin, Mel Kiper Jr., Mike Mayock, Todd McShay, Tommy Lawlor, Wes Bunting. April 29, 2011 by Brian Solomon.